It’s no secret that sometimes the best art happens during the worst times. Â In the middle of a painful breakup or in the middle of a war, artists have often created great works that resonate well beyond their own time. Â I don’t believe that artists need heavy strife and drama in their lives to create good work; in fact, I think most artists work best while happy and secure. Â But any challenge that forces your brain to explore new territory and shakes you out of your established way of doing things can produce breathtaking results. Â And I think that the challenge posed by finding a way to thrive and survive in bad times sometimes forces artists who’ve been habit-bound to work and see the world differently. If you’re the glass half-empty type, it only takes a glance around to see that we’re in bad times. Â Ecologically, financially, politically and socially, there’s a lot of fodder for thought, protest, and despair. Â And yet I feel hope. Â I look around at the world, I watch video of Pete Seeger at Occupy Wall Street singing ‘We Shall Overcome,’ I see people giving each other a hand up when they’ve stumbled, I see people taking the time to makeÂ thingsÂ with their own hands instead of feeding the corporate greed. Â And I hear a lot of really, really good music. We’re just weeks away from the Canadian Folk Music Awards, and this year I’ll be taking part asÂ theÂ host of a workshop called ‘Good songs for Bad times’ with fabulous artists Dave Gunning, Evalyn Perry, and Melissande. Featuring performers from diverse musical styles and backgrounds, we’ve got one brief hour to talk about the Good songs they’ve written during or about Bad times. You can join us at 1pm on Sunday, December 4 in Alumni Hall in the Victoria CollegeÂ BuildingÂ at the University of Toronto. Tickets for the workshops are $15, or in combination with your Gala ticket, $50, and you can purchase them here. I’ll be at the Gala as well, presenting the award for Contemporary Album of the Year – you can watch the live broadcast Sunday, December 4 at Roots Music Canada. 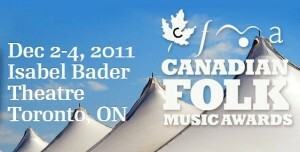 Lastly, I have the honour of being nominated for the CFMA’s 2011Â Unsung Hero Award, which is a pretty nice thing. Would you like to learn more about the artists who’ll be taking part in the Good Songs for Bad Times workshop? Called “equally funny and dangerous” by CBC Radio, award-winning songwriter, poet and ironic social commentator evalyn parry is gifted with a sharp pen, a quirky musical sensibility and a wicked sense of humour. From 19th century cycling heroines to 21st century sailors; from â€œfeminine protectionâ€ to bottled water to the quest for the Northwest Passage, evalynâ€™s outspoken creations hold out a powerful vision of social and personal change, while her irreverent wit holds nothing sacred. Â Fierce, funny, poignant and provocative, over the past decade parry has toured music, storytelling, pride, poetry and theatre festivals across the continent, taking her unique perspective on the world and transforming it into art that spans genres, genders and generations. Sultry in both official languages, Melisande holds her audience in the palm of her hand throughout her performances. 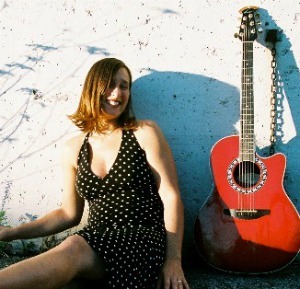 Â While Quebecois traditional music has a strong place in her life, she embraces a diverse range of influences and styles, blending them like a well-seasoned soup into songs with broad appeal, deftly delivered. 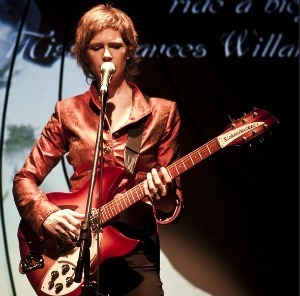 Â On stage, her presence is warm, engaging, and energetic, a performance which doesn’t stop merely at delivering songs – she engages the listener in a tacit dialogue. 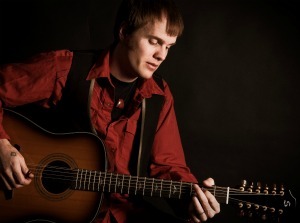 Firmly rooted inÂ theÂ East Coast tradition of songwriting that hearkens back to the traditional music of the region, Dave Gunning blends the past and the present in songs that feel as familiar and welcome as a beloved and well-worn sweater on a cold day. Â As accolades pour in, Gunning stays true to himself, his songwriting never swayed by concerns about marketing or genre – he writes what he’s prompted to write, and allows those songs to stand on their own. Â Finding inspiration and motivation in the people and stories he knows, Gunning’s works often speaks of hard times and bleak days, but never leaves the listener without the sense that all is not lost; the next day might dawn brighter. You can join us at 1pm on Sunday, December 4 in Alumni Hall in the Victoria CollegeÂ BuildingÂ at the University of Toronto. Tickets for the workshops are $15, or in combination with your Gala ticket, $50, and you canÂ purchase them here.